Is your wedding anniversary just around the corner? Is your friend having a Birthday? Are you searching high and low for the perfect gift? Then you've come to the right place because Seagull Gifts is the solution to your gift search! We offer a large variety of crystal ornaments and figurines for every occasion including Wedding, Anniversary, Christmas, Birthday as well as Baby Christening gifts and if you require a little relaxation, meditation come see our new Gifts & More section instore. Our crystal products are imported from Belgium and are of premium quality, so you can be assured that your loved ones, be it your husband/wife, boyfriend/girlfriend, that newlywed couple or your parents, are receiving nothing but the best anniversary gifts! If crystal gifts aren’t what you’re looking for, we are sure that our fine jewellery and giftware ranges will have something for you and your loved one to commemorate any special milestone. Not only do we have a good selection of anniversary gifts, our pricing is incredibly affordable in comparison to retail stores. We also offer free shipping Australia wide for orders above $50! So take your time and browse through our extensive selection of gifts, and if we can be of further assistance don't hesitate to message us [email protected] . 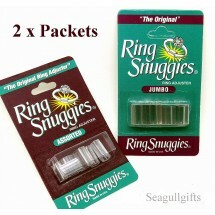 Make your special occasion memorable with Seagull Gifts!